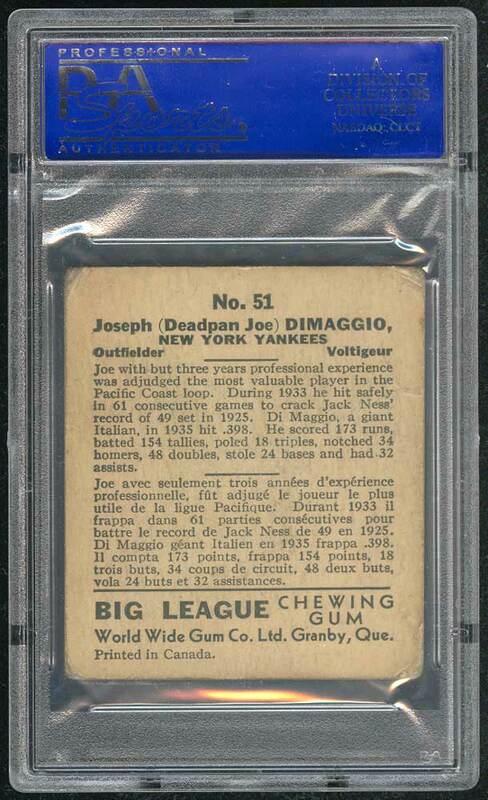 Joe DiMaggio was one of the most gifted batters in pro baseball history. Ted Williams once called him "the greatest all-around player I ever saw." 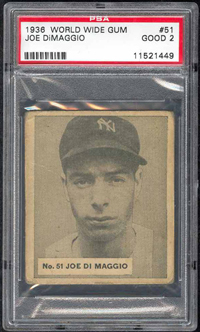 A center fielder for the New York Yankees, DiMaggio was best known for getting a hit in a 56 straight games in 1941, a streak that still stands as a major league record. 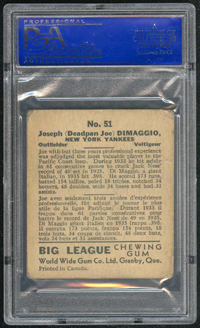 The best of the DiMaggio brothers, "Deadpan Joe" led the Yankees to nine pennants while making 13 All-Star teams in 13 seasons. A three-time MVP, the quiet, graceful center fielder is often credited with being the best player of his generation. "The Yankee Clipper" led the AL in batting average twice, slugging average twice, triples once, home runs twice, runs scored once, and RBI twice. He retired with a .325 batting average, a .579 slugging average, 361 home runs, 1,390 runs scored, and 1.537 RBI. 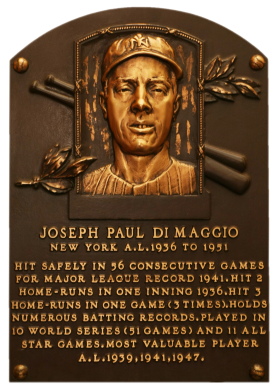 DiMaggio's graceful demeanor and extraordinary talent made him one of the great popular heroes of his day and earned him the nicknames "Joltin' Joe" and "The Yankee Clipper." He played all of his 13 big-league seasons for the Yankees (1936-42, 1946-51) before retiring in 1951. He was briefly married to actress Marilyn Monroe in 1954, and his continued devotion after their divorce was legendary: for years after her death in 1962 he sent flowers weekly to her grave. Comments: In 2002, I purchased a PSA 1 of this card on eBay. In April of 2003 another raw example popped up on eBay from a seller in Canada. It turned out to be one of the most stressful deals I've ever had. I offered an amount over the opening bid to close the auction early and they accepted. We had a deal or so I thought. I immediately purchased an international money order and sent it overnight. The next day, the seller wrote me an email explaining they wanted twice as much after speaking with a dealer about the card. I felt it was still a good deal and agreed to send another payment if they shipped the card at the same time. Upon receipt of a tracking number I would send the additional payment. The email with the shipment information arrived and I sent the money without verifying anything - stupid mistake. Later I checked the tracking number on the Canadian Postal site and nothing came back. A lot of my money was on it's way to Canada and I had nothing. Next day, same thing, no shipment data. Then Saturday, then Sunday. On Monday, I checked again - nothing. I wrote the seller. They quickly responded that it was a Canadian holiday so the system was likely not updated. Finally, the tracking information appeared. The package was supposedly on it's way. It arrived. I opened the envelope and there was the card. 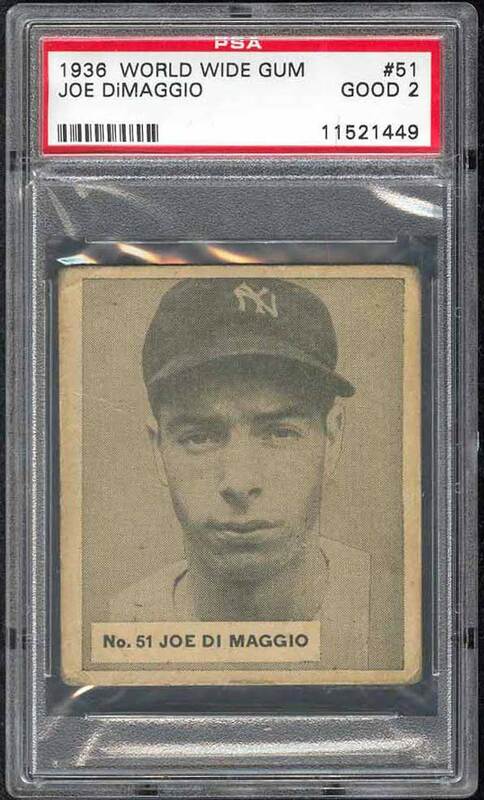 It was eventually slabbed by PSA and I had an upgrade from my PSA 1. What a RARITY - Joltin' Joes true ROOKIE card! This baby has one tiny crease and is borderline VG. One of my favorite cards! UPDATE: There was a PSA 3 at the National in Cleveland in Aug 2014, but couldn't pull the trigger. UPDATE: A PSA 7 showed up on eBay in Feb, 2017...sold for $52K - wow! 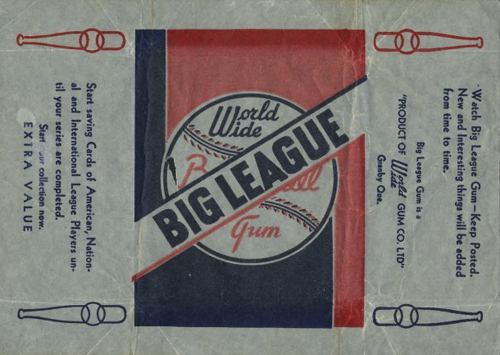 Description: The black and white Canadian set was issued by World Wide Gum in 1936. The cards measure approximately 2-1/2" X 2-7/8", and the set includes both portrait and action poses. The card number and player's name (appearing in all capital letters) are printed inside a white box below the photo. Cards are very hard to come by and rarely found in top notch condition.